I'm packing for one week of happy warm sun and one week of freezing miserable rainy cold. Austin, Texas for vacation then back to Coeur d’Alene, Idaho to finish that too long real estate course. Well, I’m supposed to be packing. Instead, I’m thinking sad thoughts as I sit here with a cup of steamy fragrant Japanese tea. Poor Japan, my heart goes out to them. I can’t even imagine an 8.9 magnitude earthquake. I think back to my college geology courses and remember how many thousands of times more powerful an 8.9 quake would be than anything I can comprehend. My cousin Shea, on her way to Taipei is at the Hokkaido airport right now. They were diverted from landing in Tokyo and ended up sitting for 9 hours in a parked airplane. She’s safe and probably bored out of her mind, but what a surreal experience for a 22-year-old. Some time ago, I realized we really are a sum of its parts. Connected to each other by our planet. Never truly separated. Global took on a more personal meaning and I became more empathetic. Maybe this new generation is smarter than mine, more aware of this concept. Take for instance this cornbread. Created by 11-year-old Dana Sly, who wants to eat vegan! When I was eleven I was riding my bike all over town and wondering if dinner would be at McDonald’s. I think the only cooking I did back then, was warming a package of Ramen Noodle Soup on the stove. Which I also happened to survive on during college. Maybe I’m finally getting smarter myself, more caring, but if I am it’s because I’m learning from intelligent kids, blogger friends from all over the world, and more information to be had then ever via the internet. All to be absorbed and questioned piece-by-piece. For now, I’ll shake my head in awe and keep on learning. 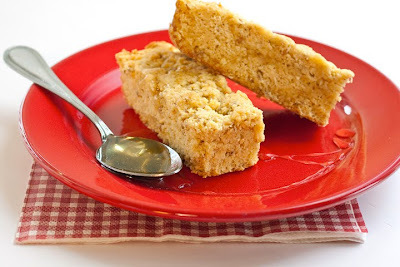 Flax seed, used as a substitute for egg, gives this cornbread a nice nutty flavor. I liked it quite well. 1. Preheat oven to 425°F Spray 8-inch-square baking dish with nonstick cooking spray. 2. Bring the water to a boil in a small saucepan. Add the ground flax seed; reduce the heat to medium-low, and simmer the ground flax seed in the water for 3 minutes or until thickened, stirring occasionally. Set aside. 4. Turn into prepared baking pan. Bake for 20 to 25 minutes, or until a toothpick inserted in the middle comes out clean. Cool on wire rack 10 minutes; invert cornbread onto wire rack, then turn right side up and continue to cool until warm, about 10 minutes longer. Recipe created by Dana Sly. Found on Food.com. Picture by Laura Flowers. I'm so sad about this tsunami too. It is so horrible and my heart goes out to everyone affected. I love this vegan cornbread. My daughter could even have it if I used her rice milk! It is truly terrible about tsunami. The cornbread looks terrific, a very healthy recipe, thanks so much for sharing! All of the goings-on in Japan are definitely too insane for me to comprehend in any real kind of way. It is nice to know that there are some superstars of the next generation who are willing to learn and care enough to do the right thing. Not that vegan is necessarily RIGHT, but it's definitely better than eating meat all day every day! This cornbread sounds delicious! The earthquake/tsunami sure makes you put life in perspective, that's for sure. My daughter and fam. live 25 min. north of us and had a tsunami warning(we only had an advisory)so they took refuge with us for the day. My heart goes out to the people of japan. This cornbread looks really yummy, Laura. We are just lucky that it was not us. My heart goes out to all of those poor people! On a side note, the cornbread looks amazing! your vegan recipe looks just great!! i will certainly try it!